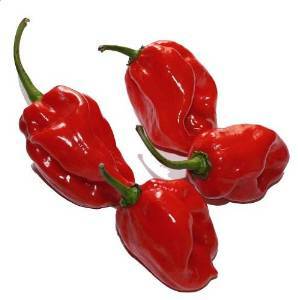 Red Habanero: 110 days - Seed for this habanero variety was found in the Caribbean, and then improved, resulting in a uniform, fiercely hot pepper that is way hotter than the regular orange habanero. Dried samples of Habanero Red measured 445,000 Scoville units whereas regular habanero tested at about 260,000 Scovilles. This pepper must be used carefully, but is wonderful for salsas, marinades, and making your own hot sauce. Bright red, wrinkled fruits are about 1-1/2 inches deep and 1 inch wide and have flavor with fruity overtones.